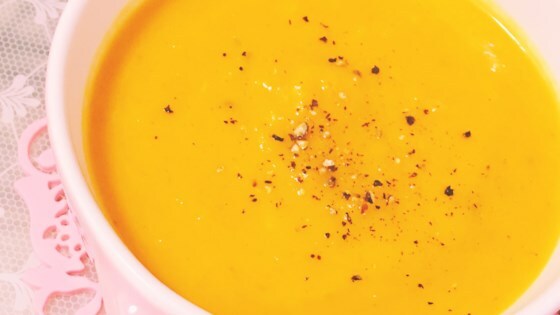 "This is a beautiful and flavorful soup that is made with pumpkin and sweet potato, and seasoned with onion and leek. Velvety coconut milk adds a nice finishing touch." Heat the oil in a soup pot over medium heat. Add the onion and leek, and cook for a few minutes, until soft. Stir in the pumpkin, sweet potato, and vegetable broth. Bring to a boil, then cover and reduce heat to low. Simmer for about 15 minutes, until vegetables are tender. Mash vegetables coarsely using a potato masher. Stir in the coconut milk, season with salt and pepper, and serve. An amazing soup! But I like it hot. I mixed in some red thai curry paste to offset the sweetness from the coconut milk. Liked it very much. And freezes well.